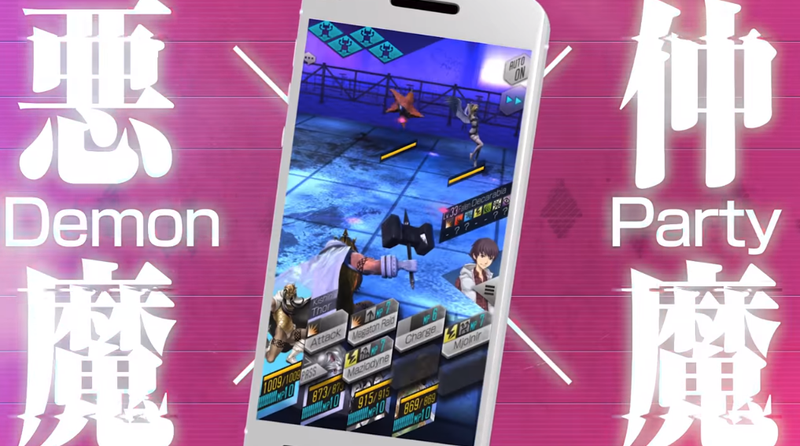 “This is the world of the downloaders,” says one of the characters early on in Shin Megami Tensei: Liberation Dx2, Sega’s mobile adaptation of the Atlas JRPG series. That was the moment I started to like this game, despite the fact that it’s free-to-play, chuck full of microtransactions, and limited to Android and iOS. Where some other smartphone adaptations of beloved games have gotten mired in the grindy frustration of Gacha-style gambling, Dx2 does a good job of keeping that stuff separate. The game uses its well-written story to keep you hooked, not cheap tricks. Your character is a “Liberator,” someone capable of downloading demons with their phone and ordering them around in battle to combat the dark forces bent on destroying humanity. It’s all part of an apocalyptic end times-style reset set in modern-day Tokyo. You operate out of a hideout where you can manage an overwhelming array of options for powering up your demons. You’re someone who spends all their time on their phone participating in paranormal events no one else can see, so like if social media were a turn-based role-playing game. When you hear about suspicious activity in various parts of the city, you investigate. Arriving at these locations sets a short conversation in motion followed by a battle that happens in three waves, occasionally culminating in a boss fight. It’s the same thing over and over but between the witty banter and polished recreation of the classic Shin Megami Tensei battle system seen in the rest of the series, it stays fresh. It might not be able to compete narratively with Persona 5, but the premise and delivery are still way better than anything you’ll find in Fire Emblem Heroes or Star Ocean: Anamnesis. I spent the first chapter of the game rummaging around the Akihabara district trying to find who was responsible for kidnapping and killing local passersby. This meant listening to my partner Rika tell me about her life-long love of firearms in between fighting all the weird monsters one would expect from a SMT game, ranging from a medieval knight on horseback, to a floating dog’s head with a giant tapeworm for a body. As in other SMT games, as well as Atlus’ Persona series, hitting an enemy with an attack they’re weak against grants an extra turn, while missing takes one turn away. You want to take out as many enemies as quickly as possible while conserving resources, but in this game, that goal is secondary., Previous SMT games leaned heavily on this resource management aspect during long dungeon crawls, but the real focus of Dx2 is talking to the demons you’re fighting and trying to get them to join your side. Like in Pokemon, the goal is to collect them all, but you’re not going to be kind to these monsters once you’ve grabbed them. You will feed them to one another or fuse them in order to create stronger, more elite versions. These negotiations with monsters almost always end with a sacrifice on your part, either a special item or some of your health. Occasionally while clicking through these conversations, I accidentally sacrificed the life of one of the demons in my party, making the rest of the fight a lot more difficult. The early parts of Dx2 aren’t too challenging, but you still have to pay attention to what you’re being asked, especially if you want to grow your team in time for the difficulty to ramp up in Chapter 2 and beyond. The game includes some eerie world-building, as characters talk about the rise of social media and how some kid got killed while making a “Let’s Dance” video out in the park, interspersed with a traditional JRPG progression system that I could see myself setting aside time to complete. Dx2 does still have another side, though—the micro-transactions. The game’s gem currency seems ignorable, at least early on, but the exchange rate looks harsh The minimum $3 buy nets you only 90 gems— 10 shy of the 100 you need to buy a random new demon. The game can sometimes be aggressive in trying to get you to spend money. At least two times while navigating from my hideout to the menu to manage my party, I got interrupted by a menu showing me discounted stuff I could buy for a limited time only. The first page of item bundles you can purchase isn’t cheap, either, with prices ranging from $20 to $50 inside a game which would be a hard sell itself for that price. So far, it doesn’t seem like you need this stuff in order to advance in the game; I’ve been able to use the game’s systems to upgrade demons with the items and currencies allotted to me from completing the main game’s missions. There’s a player-vs-player mode, and options for loaning out characters to friends to help them in battle, so perhaps the add-ons will feel necessary for more competitive players. Personally, I can’t see myself feeling the need to grind beyond the pace set by the normal game. Producer Yamada Riichiro, best known for his involvement in the Panzer Dragoon series, said in recent interview with Destructoid that the developers’ priority was finding a way to balance the free-to-play elements with the conventional kind of JRPG expected by SMT fans. “The key concept was to ‘offer a console gameplay experience on smartphones,’” he said. “I personally think that a console game must be a piece of art.” In the few hours I’ve spent with the game so far, Dx2 has accomplished that, offering a streamlined and satisfactory SMT game that also has the flare of 1995’s Hackers, the anime.